ASUS is working on new models of their ROG and TUF line of notebooks which will be featuring AMD’s Ryzen 3000 series processors and NVIDIA’s newly launched GeForce GTX 1660 Ti discrete graphics. 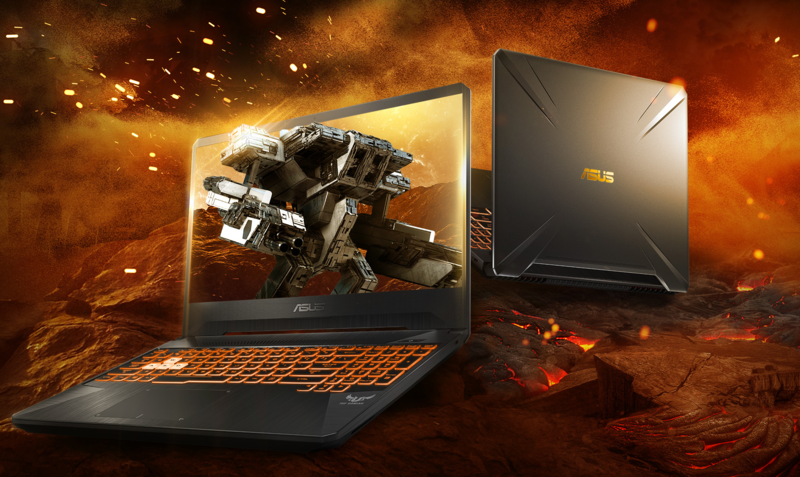 The notebook models in question are the ASUS ROG GU502DU and the ASUS TUF FX505DU. Both of these models were found in listings on 3DMark by TUM APISAK. While ASUS was known to be preparing TUF series notebooks with Ryzen 3000 series processors, they didn’t mention any kind of support for NVIDIA’s discrete graphics cards. The latest listing reveals that these models would indeed utilize discrete NVIDIA Turing GPUs. According to the listing, the ASUS ROG GU502DU would come with the Ryzen 7 3750H CPU which is a 4 core and 8 thread part clocked at 2.3 GHz base and 4.0 GHz boost clocks. 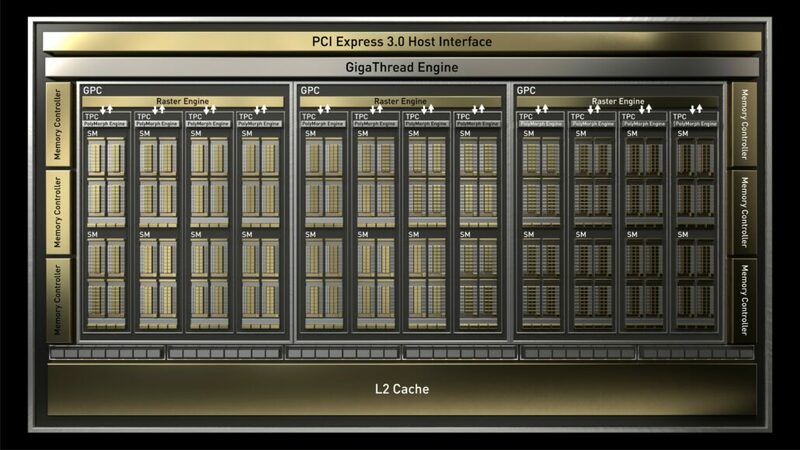 It is based on a 12nm process node and has a TDP of 35W. Now the chip does feature Vega 10 graphics with 640 SPs and a clock speed of 1200 MHz but the laptop itself is packed with an NVIDIA GeForce GTX 1660 Ti Max-Q discrete graphics card. This is the first time we have seen a mobile variant of the more recently launched GTX 1660 Ti graphics card. 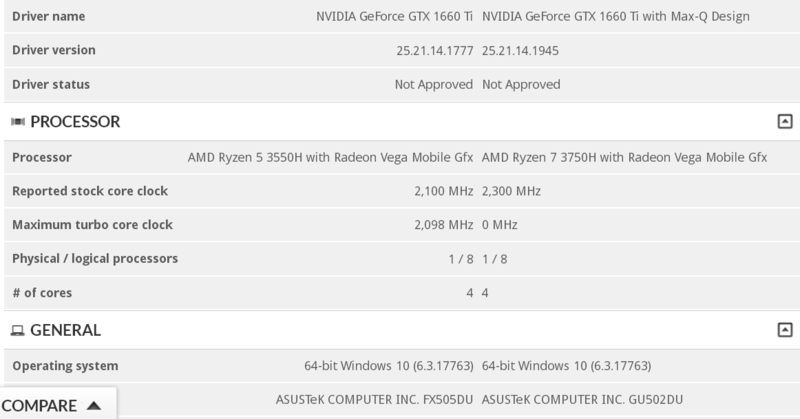 There are no specs mentioned but considering NVIDIA has kept specs parity of the desktop and mobility variants, we can expect the mobility variants of the GTX 1660 Ti to feature similar core specs of 1536 CUDA cores and 6 GB of GDDR6 VRAM however, the clock speeds can vary on the models since there would be both Max-Q and non-Max-Q variants. About the non-Max-Q variants, the other laptop, ASUS’s TUF FX505DU would feature the Ryzen 5 3550H CPU with 4 cores and 8 threads, clocked at 2.1 GHz base and 3.7 GHz boost. The chip has a TDP of 35W too but features the Vega 8 graphics chip with 512 stream processors. This laptop has been coupled with the GeForce GTX 1660 Ti (non-Max-Q), which should support higher clock speeds than the Max-Q variant. Overall, having a GTX 1660 Ti inside a laptop means you’ll be looking at much better gaming performance and since the TU116 GPU is so power efficient, you can also expect to get some decent battery times compared to the higher end RTX cards. Are you planning to purchase a new notebook based on the AMD Ryzen 3000 series CPUs?